The Weekend of Trivia L Has Arrived! Beginning Friday, January 23 at 10:00:37pm and lasting through midnight on Sunday, will be the 50th edition of the Great Midwest Trivia Contest hosted by Lawrence University. For those who aren’t familiar with this Lawrence tradition, Trivia is a 50 hour competition among both on-campus and off-campus teams to answer obscure questions penned by the year’s Trivia Masters. With one question read every ten minutes, teams have three minutes to complete each question, usually after an intense amount of Google-searching. In past years before energy drinks and laptops, teams would search through encyclopedias, atlases, almanacs, and other print sources to find answers. The Mudd Library’s archives feature some fantastic images from Trivias past, including photos of teams, sample questions, and more! Here is where you can check those out. In addition, Lux contains digitized copies of past editions of The Lawrentian– browse through student articles about Trivia! And for those of you participating in Trivia L this year, check out the MIT Libraries’ Google search tips! Hidden prizes all over the library! Plastic eggs containing a slip redeemable a prize have been hidden around the library. Bring the egg to the reference desk to pick a prize! Enter the annual Library Haiku Contest! Library Student Worker Appreciation Day on Tuesday, April 15th- make sure to say thanks for all the hard work they do! Ask a question at the reference desk, get a cookie on Wednesday, April 16th from 6-10 PM! Tell us your favorite thing about the library, and see why the staff and students love it too! Take a look at our Facebook album to see photos of the library staff sharing what it is that we love about working at the Mudd Library. The Mudd Library will be hosting a variety of fun and interesting events through the end of the term. From genealogy to video games- there’s something for everyone! Professor Erica Scheinberg will talk about the 30th anniversary of Michael Jackson’s, Thriller. Join us for our tenth Smash Bros. tournament and open gaming event! In addition to Smash Bros., we’ll also have open gaming Halo or Mario Kart as well as board games. In celebration of this milestone, we’ll have cake and extra prizes. Open gaming and warm-ups start at 6:30 pm, tournament begins at 7 pm. Learn about eerie happenings around campus. With Archivist Erin Dix. Presented by Music Librarian Antoinette Powell, the library’s foremost forebear fanatic. November marks the anniversary of Michael Jackson’s super-smash album. Learn more about the music and MJ from special guest, Professor Erica Scheinberg. All Things Worth Knowing events begin at 4:30 pm and take place on the first floor of the library. For more information on past topics, take a look at the guide. We hope to see you at one, or all, of these events! Want to know more about last week’s Things Worth Knowing topic of political cartooning? The library maintains a guide just full of information relating to each weeks’ topic. Whether you’ve attended the event or not, this guide will give you plenty of useful information that can be found on the web, or in the library’s resources. Every past Things Worth Knowing event is indexed in this guide. For example, the page for our political cartooning session contains links to library resources, such as Harper’s Weekly, and Drawn to Extremes: The Use and Abuse of Editorial Cartoons, as well as links to a variety of web resources, such as The National Cartoonists Society website, and the Pulitzer Prize list of the best in editorial cartooning. This week, we’ll be discussing the work and life of film great Joseph Francis (Buster) Keaton. Join us, Thursday, October 4th, at 4:30 pm, on the first floor of the library. Things Worth Knowing: Agility Dogs! Join us on Thursday, May 10 at 4:30 on the first floor of the library for a very special episode of Things Worth Knowing. Linda Fuerst and her champion agility dog, Maya, will be here to regale us with tales of the wild world of agility dog training and competition. Not to be missed! Time Again for Things Worth Knowing! 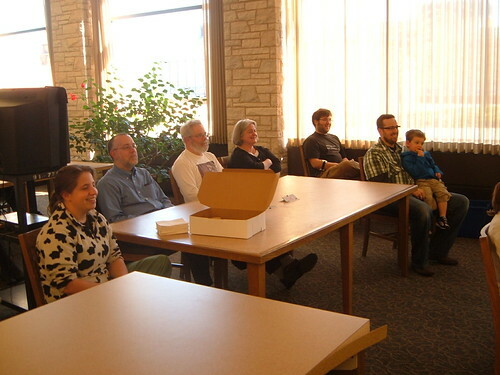 Audience members enjoying a Things Worth Knowing presentation and cookies. Do you have a hidden (or not so hidden) area of expertise you would like to share at a Things Worth Knowing event? If so, contact Gretchen Revie by email or at 920-832-6730 to inquire about arranging a presentation. Friday the 13th is just a few short days away! Did you know that the library has many horror films including the entire Friday the 13th series? Check them out in the Media Center under call numbers PN1997.F7533. We’ll also be discussing some of the history, superstitions and phobias that surround this dreaded day Friday at 4:30 pm on the first floor of the library in our weekly Things Worth Knowing series. Come join us…if you’re not scared, that is. A few weeks ago, we began a new tradition in the library: Things Worth Knowing. 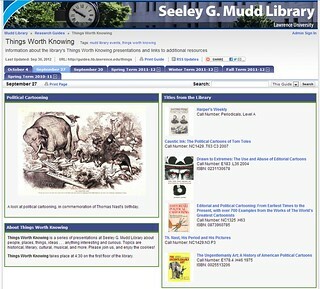 Our patrons may not know this, but the denizens of the Mudd Library have a vast knowledge on a wide variety of topics. What kinds of topics? Check out our Facebook page, or take notice of the fliers around campus to find out. We begin advertising Tuesday or Wednesday for the topic that will be shared on that Friday. Our first program happened to take place on the one hundredth anniversary of the Triangle shritwaist factory fire. Music Librarian Antoinette Powell discussed the workers’ rights movements of the time, Acquisitions Assistant Amanda Lee shared a poem on the tragedy of the Triangle fire, and Gretchen Revie introduced a short film about the fire. Our second program was on April 1st, so the topic chosen was the history of April Fool’s Day. Gretchen Revie discussed the history, and Archivist Erin Dix shared some April Fool’s issues of The Lawrentian. Tomorrow, April 8th, we will geek out as Interlibrary Loan & Circulation Assistant Angela Vanden Elzen discusses the history and impact of Dungeons & Dragons, and Gretchen Revie delves into the world of Buffy the Vampire Slayer. All Things Worth Knowing events take place from 4:30-5:00 p.m. on the first floor of the Mudd Library. Of course, cookies are always available. Let us know if you have any suggestions of topics you’d like to hear us talk about! Take a look at all previous Things Worth Knowing events on our Facebook events page.